We were delighted to find this functional, yet oh-so-lovely Vintage Porcelain Scalloped Footed Berry Colander Heart Shaped Hole Design Pink & Yellow Crysanthemum Motif, with its colors bright and design intact! The interior of this beautiful Vintage Porcelain Scalloped Footed Berry Colander Heart Shaped Hole Design Pink & Yellow Crysanthemum Motif flaunts a background of soft green with an array of pink and yellow chrysanthemums accented with enamelled touches, amidst gold beading and gold embellishments. 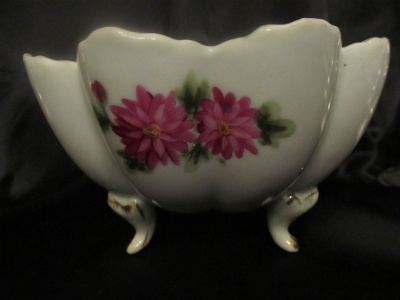 The outer rim of the Vintage Porcelain Scalloped Footed Berry Colander Heart Shaped Hole Design Pink & Yellow Crysanthemum Motif is 6-1/2" in diameter at its widest point, and it stands 3-3/4" in height. 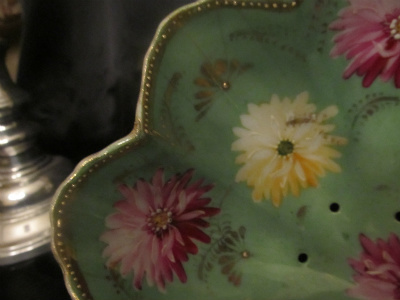 The holes at the base of the vintage porcelain colander form a heart pattern -- intentional or accidental? We don't know, but it is certainly charming! 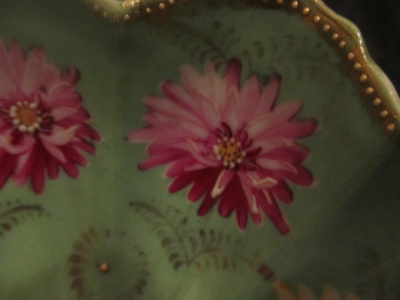 Transfer designs of pink chrysanthemums adorn the outside of the vintage porcelain bowl, and the three curved legs still boast traces of gilding. This Vintage Porcelain Scalloped Footed Berry Colander Heart Shaped Hole Design Pink & Yellow Crysanthemum Motif, though clearly used, has survived the years without a chip or a crack. Even the gilding on the inside of the colander, while somewhat worn, is still largely intact! 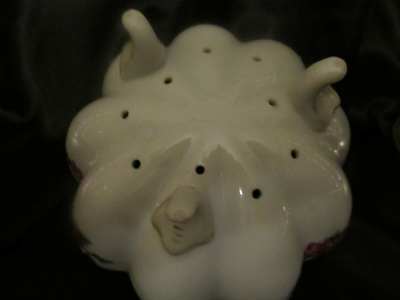 It is, in our experience, highly unusual to find a utilitarian piece in such good shape, and decorated with such care. Please examine our photographs and judge for yourself!